Emirates A380 First Class, aka the Las Vegas of the Skies, is mostly a joy to fly, and I definitely had a better experience than last time. Here are the 5 things I love about it and 3 I don't, of course relative to other first class products. 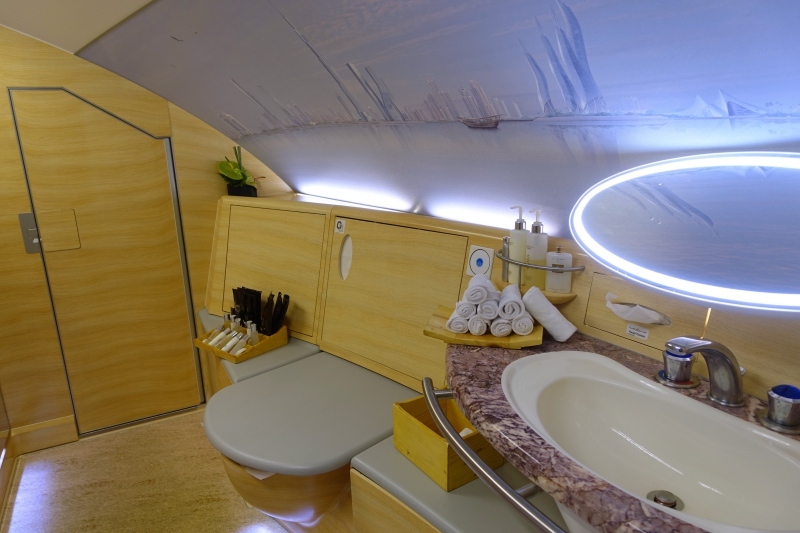 On an airplane, space is a true luxury, which makes the Emirates A380 bathroom that much more appreciated. It's great to have ample space to change clothes in, or to help a young child if you're traveling with a kid. 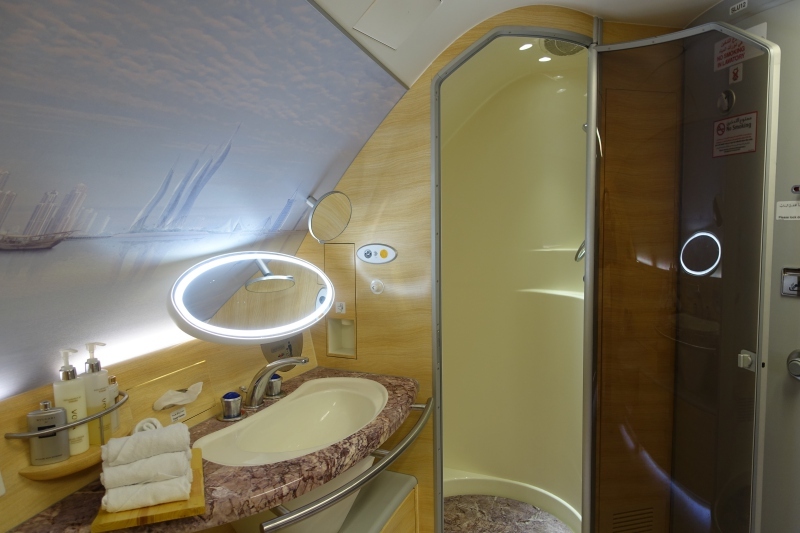 Emirates First Class is known for its onboard shower, and there's no question the shower has an edge over the one for Etihad First Apartment, which is in a much smaller bathroom, and is a simpler setup, without such a large fluffy towel, bench in the shower, etc. A shower is so refreshing on a long flight, and a great way to rehydrate your skin given how dry the air is. 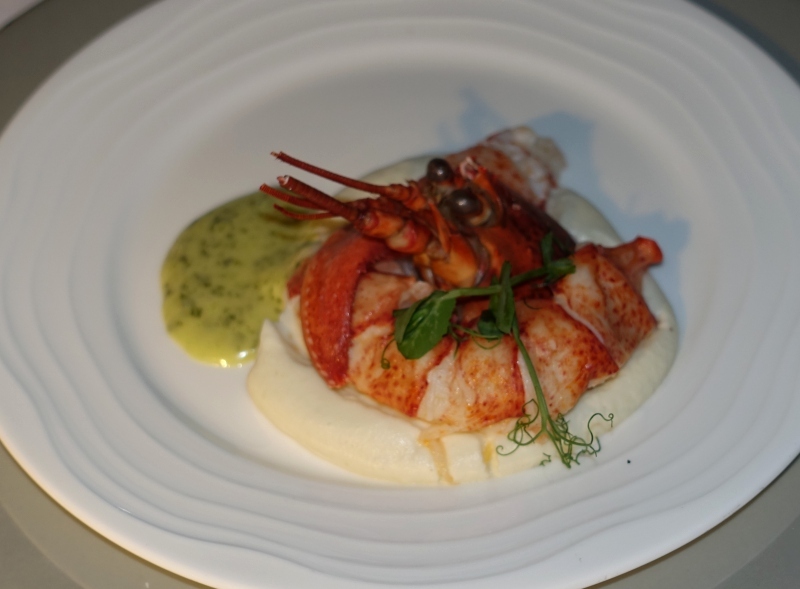 While Emirates First Class doesn't have an onboard chef, as does Etihad, I was pleasantly impressed with all three of my choices, from a lobster appetizer to a perfectly cooked sea bass fillet, to a chocolate tart for dessert. In fact, it was one of my favorite airline meals to date and worthy of an excellent restaurant, which is often not the case, even in first class. While I do wish the bed was flatter (it's not perfectly flat, because the leg part slopes down slightly) I did otherwise find the bed one of the more comfortable first class beds, after Singapore Suites, JAL First Class and Cathay First Class. 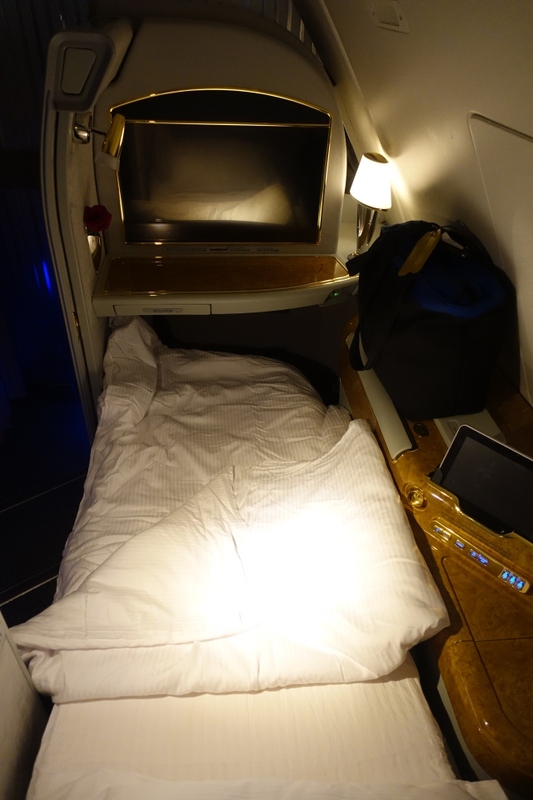 The mattress pad is actually thicker than Cathay's, so in that sense it's more comfortable as it's better padded, but Cathay's bed is completely flat, so I'll put Emirates in 4th place. Etihad First Apartment has a completely flat bed, but the mattress pad is thinner and the bed is just too hard. To be honest, I'm as happy or happier with open suites that don't have closing doors, if there are fewer open suites in the first class cabin and are arranged for privacy, such as Cathay Pacific First Class. 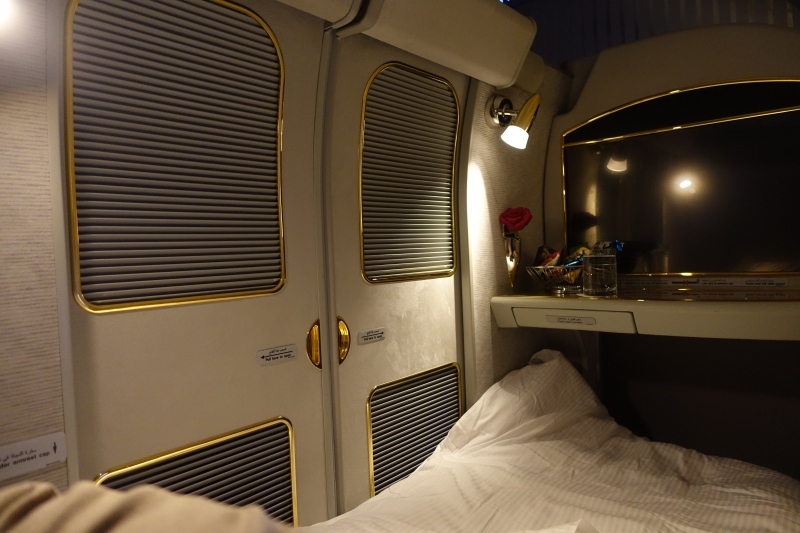 But in Emirates First Class, with the many suites and aisles with more foot traffic, I'm glad to have closing doors for a bit more privacy while sleeping. Usually you're faced with the problem of where to put pajamas and amenity kit if you're traveling very lightly and don't have much spare room in your existing carry-ons, but the great thing about Emirates First Class is that you're given an Emirates Beach Bag that contains your pajamas, amenity kit and slippers, so if you do keep your pajamas and amenity kit you have an easy way to carry them. 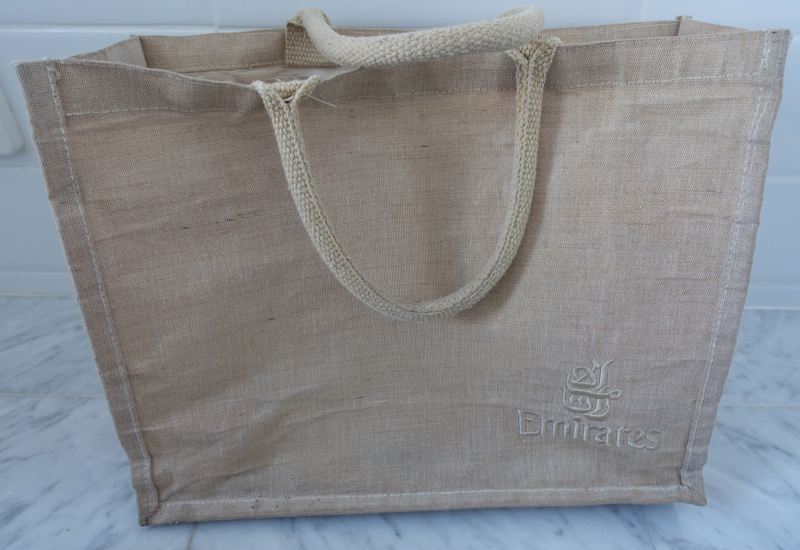 And as I've written in My Favorite Airline First Class Mementos, we've gotten a ton of use out of each of our Emirates Beach Bags. One of the things I like least about Emirates A380 First Class is that there are 14 suites, so on a fuller flight, it feels crowded. Fortunately our first class cabin wasn't completely full, but even so, there were times we waited for the lavatory, and you're simply in closer proximity to more people than, say, in Cathay Pacific First Class, which has just 6 suites. Don't get me wrong, the purser and several other staff who assisted us were lovely and friendly; but some other staff were more perfunctory and seemed somewhat stressed. And the two times I encountered a captain or first officer in the first class cabin aisle he made no effort to let me past, so I had to scoot into an unoccupied suite to let him by. I've found Singapore Airlines to be at the other end of the spectrum–much more consistently professional and helpful, certainly in First Class, but even in Economy. And the few times I encountered pilots/first officers, there was at least a courteous nod or smile, recognizing that passengers are clients, and are the people who enable them to receive a salary. While I do appreciate the thicker mattress pad than some other first class products, I wish the bed was flatter, since it slants down in the leg area. I also wish the suite had an ottoman, so as to allow even those in window seats to dine across from each other. It's also hard to get out of your seat with the dining table in use, or to plug in head phones if you already have your dining table unfolded, since the headset jack is in the armrest under the table. 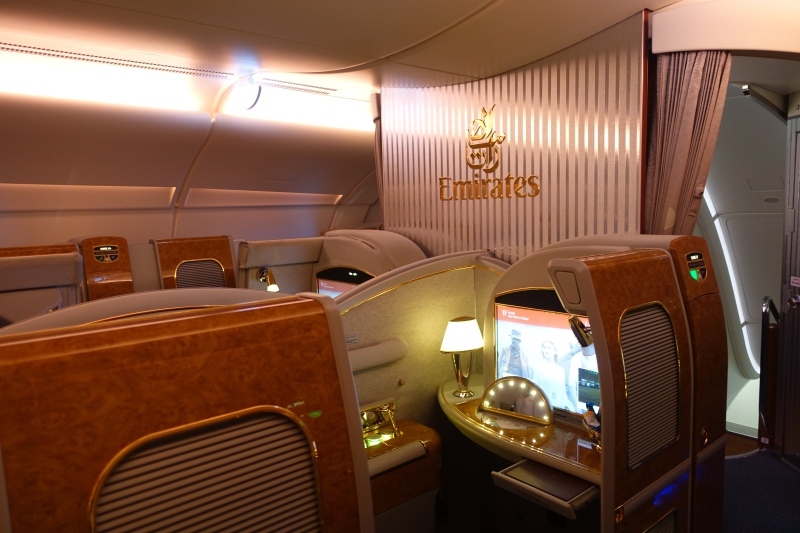 What do you enjoy most and least about Emirates A380 First Class? Flying First Class with Kids: Which Airlines and Seats?